All Nighter mimics the popular bull-themed energy drink, and actually CONTAINS CAFFEINE! Back by popular demand! All Nighter was a limited release flavor used at trade shows, and it was so popular we've added it to the line up! All Nighter mimics the popular bull-themed energy drink, and actually CONTAINS CAFFEINE! This bold and tart flavor is sure to wake up your taste buds! 100% American-Made E-liquid. Incredible juice that’s so innavative. Never had anything with caffeine in it in a vape form. So awesome and cool. Highly recommend people to try at least once. 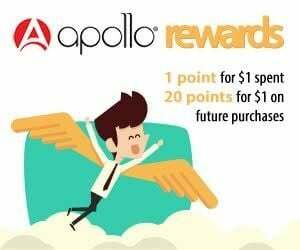 Apollo gives you wings! But no really the flavor is great and very spot on to a red bull flavor. It actually has real caffeine in it too! I don't think it does any affect on me but I do still like knowing that i have an extra boost if I need it. It's the only one I like now. I used to like tobacco, but now I like All Nighter. Good experience with shipping and customer service. Ended up liking this one but it is a bit too sourish for me. It does have sweetness to it and i do think they did a good job making it taste like red bull. cant wait to try some more flavors out. As I started, it really needs a stronger flavor. I'm not a chemist but I'm sure you can give All Nighter a little more Red Bull flavor. It's not bad but it could be better. Look into this please. I remember that this one was limited edition. I am so happy they made this a permanent flavor because I always always buy this one. I never get tired of it. It is sweet but also sour as well. I really love this one and I will always buy this one. It tastes just like a red bull!. I really like the flavor of allnighter. I've tried others but always come back to allnighter. This is good stuff. I normally don't like flavored juice but this is nice! Why does this need to be 25 characters. Taste is good but liquids is too thin for my taste. What is the PG/VG on the All Nighter?